This post is a list of 8 Apps with the best user experience projects of the first quarter,every one of them stands out for unique reasons. Making great UX Applications is like doing jigsaw puzzles, every designer may spend his whole life chasing the decisive pieces of it. And after combing through hundreds of distinctive Apps in the first quarter, we finally screen out 8 Apps that can be called the best user experience projects. Some stand out for their practicability and adaptability, some for adding a little more fun to the world. Now let’s check them out. This App allows you to list your important things that you do once in a while. Have you been wondering the last time you did something? The last vacation? The last time you call your mum？Or the last time you brush your teeth? With “Last Time”, tracking your last times becomes a bit of fun and a bit light-hearted. It offers a pattern for you to properly manage your memories in a smooth way. We believe it’s meaningful as the best user experience projects must mean something. Mr. Muscle is a quick-action game that needs plays to cut the heavy block right from the middle to help our sturdy weightlifter to maintain balance. The game sounds traditional but it’s the flat design and details in this game that makes Mr. Muscle stand out. By the way, the music and sound effect are also interesting. Spark is an email App that can make you fall in love with sending/receiving mails again. Spark is an example of the unification of abundant visual content and perfect order. It’s amazingly comfortable to experience the animation curves in the entire environment. The guide page and icons in setting page also echo with the feeling. In a word, everything just fit in beautifully. It’s enough for Spark to stand out among hundreds ofuser experience projects. Many mobile device companies have invested a great amount of money in wallpapers to decorate their user experience projects. For wallpapers are the mostly seen backgrounds, a piece of splendid wallpaper not only pleases users but increase user experience on a large scale. The photos in HPSTR all come from high-quality sources like Unsplash(iOS/android), Reddit(android), 500px(android). What is more, the key of HPSTR is that it allows users to create unique wallpapers by custom edit. Icons in HPSTR are symbolic and everyone can master it in 10 minutes. Unread is an exquisitely designed RSS subscription software. There are many factors why this App surprises you. Gestures support, lignt weight App design, immersive reading, all combine to provide you with the best user experience at the first sight. Mood is more of a mood diary. Users only have four faces to choose from, namely, happy, not happy, sad and angry. 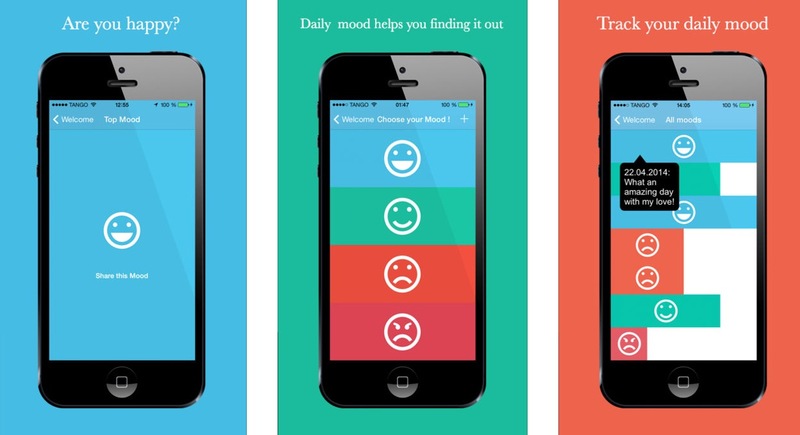 Users can check their mood at different times through a day. It’s so simple, but you are just satisfied with it among many diary user experience projects. The use of color in Mood is impressive. You will understand why Solar is in this list immediately you open it. Different from other user experience projects, it interprets the conception of minimalism. No floating action buttons or redundant lines are shown in the interface, varies functions are all hidden in the gesture await for you to explore. Aiming at wiping out all unnecessary design, DailyCost creates a brand new way of daily accounting. In today’s market, accounting applications are mostly tiresome because of functions like multi-account, debit, business, budget, etc. They are actually too powerful to be used in everyday life. DailyCost solves the problem perfectly in a materialized interface, making accounting easier than ever.